This hole is guarded by three bunkers. 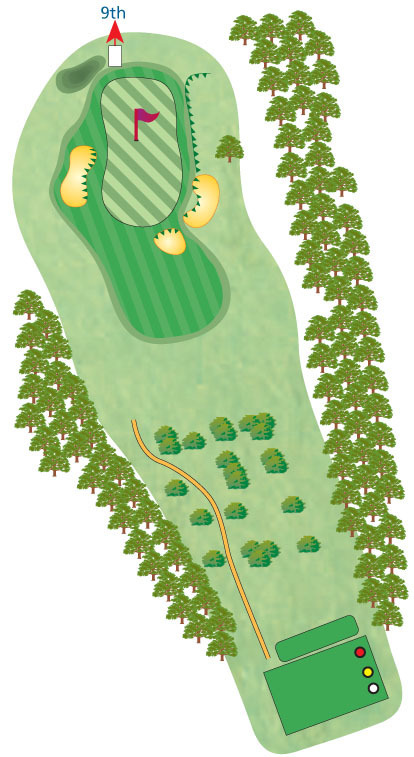 •If you hit your ball into the bunker and it is unplayable, you can declare any ball unplayable unless it is in a water hazard (rule 28); you can opt to return to play another shot from the same spot as you took your original shot which landed you in trouble, but taking a penalty. If for example, your tee shot, number one, one went into the bunker, you will now be playing shot three from the tee (rules 20.5(a) & (b)). •You can also opt to take a penalty drop within two club lengths of the ball. Note; you cannot drop the ball outside the bunker if you choose this option. When you drop the ball you must stand erect and hold it at shoulder height and arms length (rule 20-2a). 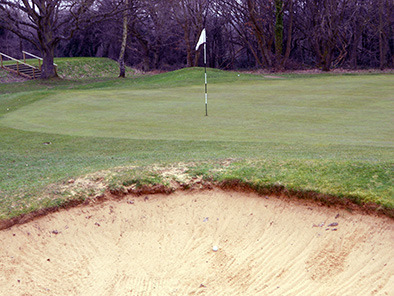 The ball must come to rest no nearer the hole (rule 20.5 (c)). •There is some debris you can clear from a bunker. A local rule allows you to clear stones (local rule 3). You can also clear anything artificial that is foreign to the area, such as an empty water bottle. This is defined as a ‘movable obstruction’ (rule 24-1). •Some debris cannot be cleared. Such an item is defined as a ‘loose Impediment’ and is natural material, such as leaves, pine cones or twigs (rule 23-1). •You cannot ‘ground your club’ in the bunker (rule 13.4b). This means you cannot touch any sand in the bunker with your club prior to playing your shot. •If you touch anything you should not, such as a leaf, it is a two shot penalty, or loss of hole in match play (rule 13.4c). •You can touch a leaf or twig after you have hit the ball, but if you touch it on your backswing, it is a penalty; as set out above.